Do you love that flavourful rich broth with springy noodles topped with char siew and egg? Japanese ramen lovers, this event is for you! 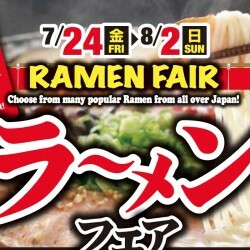 From now on till 2 August 2015, Meidi-ya Supermarket at Liang Court, the biggest Japanese supermarket in Singapore, is having a Ramen Fair featuring many popular Ramen from all over Japan!